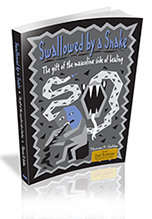 Swallowed by a Snake is a book that both men and women will find helpful. A man reading these pages will find a book that honors the uniqueness of a man’s path toward healing. A woman reading this book will benefit not only from gaining a deeper understanding of the men in her life, she will find herself in these pages. Although the majority of examples are about men it is an indisputable fact that women find this masculine gift a powerful ally in their own path toward healing. Both genders have access to the gift of the masculine side of healing. Each of us has both masculine and feminine qualities—it is our unique blend of these that determines our best path to healing. As a beginning grief therapist in the late 1970’s I can remember the difference I felt when a new client I would receive was a man or a woman. Somehow a woman seemed easier to work with, requiring less effort in helping her to do her work. A man, on the other hand, many times meant trouble. Somehow men didn’t seem to fit our program. Being the only male therapist, I would tend to get most of the male referrals. The reaction of the female therapists to male clients was somewhat stronger than my own, with some staff members even refusing to work with men. Various criticisms were heard about the way men grieved or didn’t grieve. It took me some time to realize that the type of therapy I had been taught to do was designed for women. The vast majority of clients who visit therapists’ offices are female, and due to this, therapy is shaped accordingly to fit and be effective with women. I slowly began to realize that there wasn’t something wrong with the men—there was something wrong with the therapy. This book will take you on a journey that parallels my own struggle in finding out what does and doesn’t help men in healing their grief. “Swallowed by a Snake” is divided into three sections. The first section begins with three chapters devoted to understanding the experience of being swallowed by the snake. What is it? What makes it difficult? How do we get out of it? Through my years of experience in working with men and grief I have found that men need grief defined in this different manner. Chapter one will begin by defining grief in terms that men will understand. Terms like chaos and desire will supplant the usual definitions of grief in terms of feelings. The second chapter will give information to assist people in gauging their grief. It will explain the reasons why some kinds of grief are more difficult to handle than others. The third chapter provides a practical guide to the mechanics of ritual in order to allow each person to evaluate and understand their own way of healing. 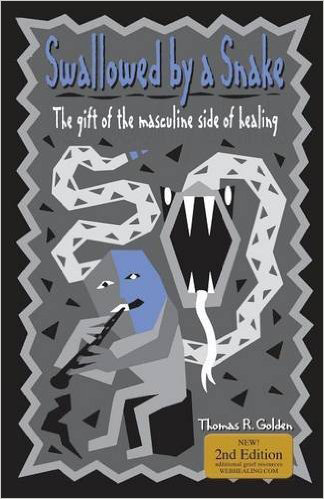 Section two is comprised of four chapters and examines more closely the experience of healing through the masculine gift. In chapter four we begin with a story that illustrates the importance of standing in the tension of your grief. By this I mean consciously and willingly experiencing your pain. We then look into what facilitates a man’s connection to his grief, and what makes this connection difficult. In chapter five we focus on the building blocks of grief: the experience of feelings. We take four of the feelings of grief—anger, sadness, helplessness, and guilt—and discuss how they relate to a man’s grief and how each one is difficult or not for a man to process. These are certainly not the totality of feelings in any grief response, but in my experience these four emotions accompany the vast majority of grief reactions. In chapter six we will look into some of the reasons behind gender differences in processing feelings, and specifically in grieving. Men and women have different paths in processing and healing their grief, and this chapter will examine the underlying reasons for these differences. In chapter seven we examine “different” ways to grieve. These ways are different because they vary from the traditional healing of grief through crying and talking about it. We will give examples of these different ways, showing how men have connected their pain and tears to ritual activities. These actions are divided into three categories: creativity, practicality, and thinking. All of these categories can include actions, places, or things which aid men or women in connecting with their grief. It is important to note that the gift of the masculine side of healing (usually action-oriented) is not exclusive to men; many women use these modes of healing and use them well. In the same vein, many men use relational skills (crying and talking about it) to heal their grief. We are painting with broad strokes if we attempt to link men with action and women with relating. In general, men tend toward action as a primary mode in healing their grief while using relating as secondary, and women are the opposite. What we are describing are tendencies, not hard and fast rules about a man’s way versus a woman’s way. Perhaps a helpful way to look at it is that men have a feminine side and women have a masculine side, and it depends on your own unique mix of these two as to how you will choose to process your grief. As you are reading, you might want to frame it in such a way that when we are speaking of men, you think of your own masculine qualities and when we speak of women, you are reminded of your feminine side. The last section focuses on the “ground” on which we struggle to heal ourselves— our culture and its lack of a socially-sanctioned ritual process. This lack makes grieving difficult for both men and women. In chapter eight we will look at examples of the way people have grieved over the last thousand years in order to bring some contrast and understanding to our present state of ritual poverty. We will see that our culture is deficient in sanctioned rituals for healing grief. Chapter nine will show how indigenous cultures around the world have made grief a part of their lives and honored the difference in healing paths of men and women. We will see how these cultures have honored men’s and women’s unique needs in healing their grief. The two cultures which are featured will show men and women performing rituals together, functioning as a team, but playing their own unique roles within the process. From this we can draw ideas and insight to aid us in our own healing, and in our understanding of how men and women can work together in a healing effort. Grief is a problem without an easy solution. When anyone confronts a problem that has no solution he or she will often feel lost. When a woman feels lost, she tends to ask for help. When a man feels lost, he looks for a map. This book is intended to be that map. I hope you find this material helpful. Is this a good book for a pre-teen boy? My son, Jonah, is 11 and he and his 13 year old sister, Emily lost their dad 22 months ago and he is only now starting to become afraid to go anywhere especially places we visited as a family. We are about to go to Dan’s birthplace for Christmas and he’s quite anxious about it. Hi Joyce – It might be a little advanced for an 11 year old but I would urge you to get a copy of the newer book “The Way Men Heal.” It’s a quick read and I am thinking you might read it first and then find sections you could read together. Also, I am presently working on a book for helping moms get closer to their sons. It includes lots of info about how boys heal and how they are very different from their sisters. That one should be out this winter. There are a couple of articles I wrote about the boys and moms piece of things and you can see those here. AS I was writing this I was thinking that the story in the Swallowed by a Snake book might be good for you all to read together. It would make it easier for him to discuss the story rather than try to focus directly on feelings. Then again, your son may be different. Blessings to you and you family. Will this book be good for my sister and husband to read after my sister miscarried? Blessings to Aunt Diane who loves her sister.